As the new semester begins, BHSEC students welcome new faces, say goodbye to old ones, and greet those returning. Walking by the third-floor guidance office on the first day of the Spring semester, the familiar “Congrats Ms. Gesoff!” poster filled with warm signatures could be seen again. Inside the room, Ms. Gesoff was back, busily taking phone calls as if she hadn’t even left. Pictures of her new baby sat on her desk, a smiling face with bright eyes. This semester, we welcome back Ms. Gesoff and congratulate her on the birth of her baby girl, Raya. While BHSEC students were getting their new schedules last term, Ms. Gesoff was getting a hand at being a mother for the first time. Just four days into the semester, Raya was born on September 6, 2014. This left Ms. Gesoff on maternity leave for the fall semester while Colin Wiseman took her place. 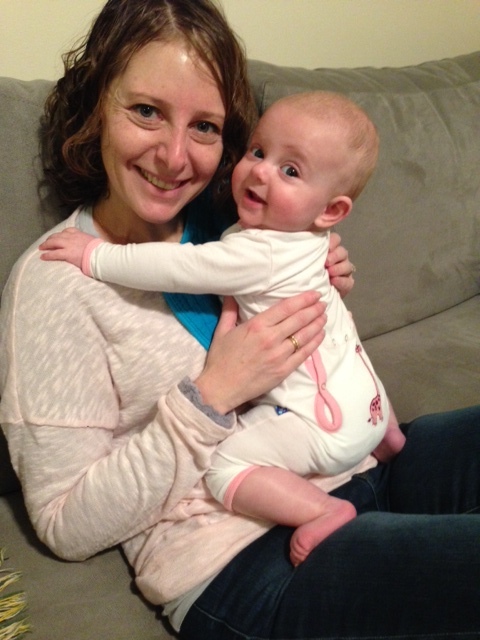 While on leave, Ms. Gesoff enjoyed family time and getting to connect with her new baby and the new lifestyle. Her sister was on maternity leave the same time as her, and so they were able to share the experience together. “Everything was great timing with me and my sister. I really valued the time I got to spend with my daughter, sister, and nephew,” said Ms. Gesoff. Overall, she characterized her maternity leave as fun and exciting. She got to connect with other moms while participating in Mommy and Me Yoga classes in Prospect Park. “I actually made friends with Dr. Mazie’s wife,” she explains. “They had a daughter a little before I did, so it was just a great coincidence.” Since she’s back, Mr. Wiseman is now taking over for Ms. Cheikes in the CTO who is currently on maternity leave with her twins. Mr. Wiseman is also teaching a psychology class, but is still counseling students. Now that Ms. Gesoff is back, she has to balance her work and home life more carefully. “I have to leave exactly at four,” she says, in order to pick up her child from daycare. Before, she was able to stay later, but now she is on a more confined schedule. Overall, she is extremely happy to be back. “If I didn’t love this job, it would be hard to come back, but I love you guys,” she expressed. Ms. Gesoff liked getting caught up with everyone, and of course talking about the new addition to her family. She looks forward to reconnecting with students and seeing how college acceptances are going. Ms. Gesoff also hopes to meet the new students, since she was unable to in the beginning of the year. Students are happy to have her back as well. “Ms. Gesoff is very personable and kind. I’m happy to have her back,” said sophomore Alejandro Schmeider, 10th. With all of the new faces around BHSEC this semester, it is nice to welcome back one we haven’t seen in a while. We welcome Ms. Gesoff back to school this semester, and congratulate her on her new baby and motherhood.